We are looking for new Members to join our ever so happy and friendly group, sing, dance, help backstage and have fun …..which is guaranteed! We will be casting our show beginning of March 2019. We are looking for extra men for this production and would invite anyone who has a left and right foot to come and join us. Our shows need many different skills, so even if you do not wish to perform on stage there are many other jobs that need to be done so please contact us if you wish to be involved. This is a Musical Comedy written and directed by our very own Gill O’Flaherty. The Synopsis: A group of U3A members, who always travel abroad, have decided this year to stay at home – now called a ‘Staycation’. They use a bus tour company and end up in some great adventures – travelling around Great Britain with song and dance – before returning to their Community Centre in Ormskirk. Our next production will be an adaptation by John Hardiker of Tony Crimlisk’s highly acclaimed “Up for It”. At the Civic Hall on the 3rd, 4th and 5th May 2018. commencing 7.30 p.m. This is a great musical comedy first shown in 2011 and follows the true story of a group of pensioners who travel to London to join in a rally in Trafalgar Square. They intended to strip off to protest against pension cuts (sounds familiar). For more information search the Internet for ” Naked Pensioner Protest”. Some Great pictures from Musical Memories. We Got Life is a generic story located internationally, told in song and dance. Beginnings, hope, reality, oppression, despair, dreams, inspiration, protest, revolution, escape, happiness, fulfillment and renewal. We hope that will reflect history as well as present day, expressing our lives, struggles and diversity and yet have the audience experience the sensation of that space between a tear and a smile with some well loved songs that have already touched our lives and a few ones to intrigue. Make a date to go along to this October to attend the next Musical Theatre Show. Click or tap on the Poster for details. This was a first for the group and a Comedy Farce in classic Brian Rix style, set in a large house in a remote village: a clinic that offers sanctuary, rest and relaxation therapy to celebs, but has seen better days with just two celebrities. Meanwhile in the same village there is an old folks home. Absolute chaos then ensues when the celebs get mixed up with the old folks, there is a power cut following an explosion, and a “Real” celeb then arrives. The old folks end up as staff, new premises have to be found with make shift rooms, then more chaos following a massive flood, in and out of doors, complicated manoeuvres, narrowly avoiding their naked forms. Our Old Time Music Hall show is now completed and was a huge success, thanks to your support! Both nights were very well attended and generated lots of smiles and laughter – which is just what we’ve all joined the U3A for!! The show was directed jointly by the very talented Chris McCabe and Gaynor Hale who both have many years of stage experience behind them! It was staged at Aughton Village Hall on May 13 and 14, 2016. 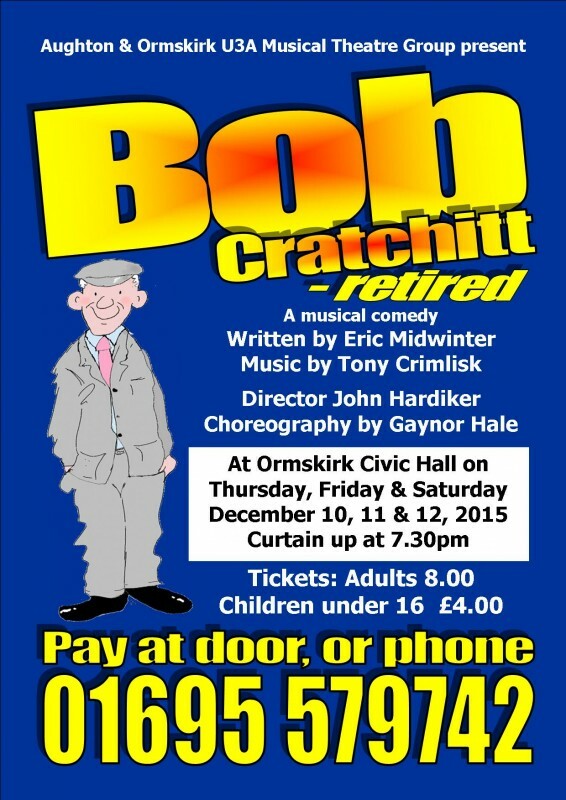 Bob Cratchitt…retired was performed at Ormskirk Civic Hall in December 2015. It was written by the very talented Eric Midwinter, one of the founder members of the U3A in Britain. It’s a sequel to Charles Dickens’ A Christmas Carol. Tony Crimlisk wrote the music, John Hardiker directed and Gaynor Hale was our choreographer. We thank you for all your usual support for this very special show and hope it got you in a festive mood just in time for Christmas! Some of the cast getting into the Christmas spirit! What a fascinating and glorious occasion! Although I’m supposed to be a wordsmith, I’m struggling to express how much it meant to me to see ‘Bob’ spring to life with such energy, pace, colour, laughter, dazzling effects, theatrical pictures, superb costuming, enthralling music, well-executed, rounded and adeptly comprehended characterisation…, to quote ‘The King and I’, et cetera, et cetera, et cetera. Knowing you are meeting up on Monday, would you please convey to everyone involved a most genuinely felt and affectionate vote of appreciation from the author. Thank you doesn’t cover it – but ‘thank you’. I hope to see you and, who knows, collaborate with you all again in the future. Known for pulling out all the stops to create original productions this society’s latest effort is no exception. With the script and lyrics written by Eric Midwinter and music by the society’s own Tony Crimlisk it is an upbeat story of Bob Cratchitt as he approaches retirement age. A giant Christmas cracker opens the show through which is seen the interior of Scrooge’s and Marley’s shop (where nothing is ever knowingly undersold) with the Company looking festive in a flurry of red costumes with white faux (I hope!) fur. It is Bob’s 65th birthday and, after 50 years of working in the store, the staff are holding a party to send him on his way clutching a gold clock. Jane Morley (Dorothy Prothero) has been married to Jacob Marley and is now holding a torch for Ebenezer (Tony Adamson). David Davies takes the eponymous role with Maureen Morris as his wife, Martha. ‘Tiny Tim’ (Colin Ratcliff) has grown up and is cured of his Dickensian impediment. He’s now a wealthy banker who lives in a 27-roomed mansion. Playing his snobby wife, Theresa, is Gill O’Flaherty who takes the comic role very well. It has been good to watch her progress over the past few years from choreographer and dancer to comedy actress. The three inevitable ghosts (who ‘like to sing in chorus’) – Ghosts of Retirement Past (Bill Edwards), Present (Teresa Edwards) and Yet to Come (Sue Hardiker) arrive to convey the message that retirement does not have to be boring when the fabulous University of the Third Age is prominent. The good pace of the show owes thanks to John Hardiker’s expert direction and Gaynor Hale’s clever choreography together with the vivacity of the cast, seasonal costumes and stunning scenery. Congratulations to the whole team! Score: 8/10 – Very enjoyable! A big THANK YOU to everyone who supports our productions; our group work very hard for many months to put them on stage and it’s very encouraging to know we can depend on you after all our efforts. It’s a musical called ‘Bob Cratchitt, retired’ which tells the story of the character from Charles Dickens‘A Christmas Carol’ as he reaches retirement. The musical is written by the very talented Eric Midwinter, one of the co-founders responsible for introducing the U3A to the UK during the early 1980’s. The music has been written by our very own Tony Crimlisk and there will be more news about the production in the magazine and on the website as rehearsals progress throughout the year. BayTV visited the group at one of our rehearsals and produced the attached video clip.